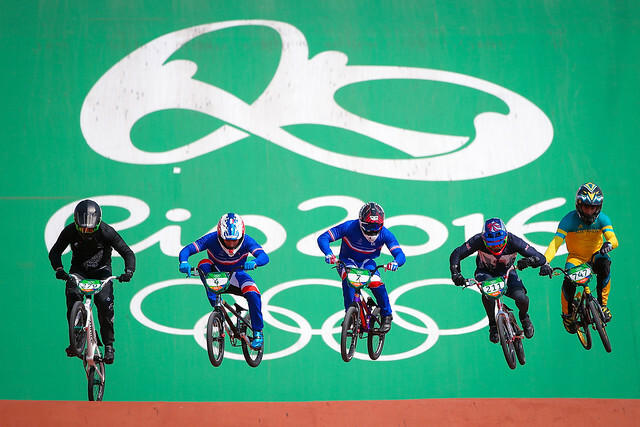 Team GB’s Liam Phillips and Kyle Evans exited the Rio Olympic BMX competition at the quarter-final stage. Phillips, in his third Olympic Games, crashed in the first run of three and was forced to withdraw from the competition. Kyle Evans completed three clean heats of his quarter-final but did not progress to the semi-finals, after finishing outside of the top four. The riders needed to finish in the top four of the eight riders in their heat in order to qualify for the semi-finals on Friday. “It was always going to be tough when you’re at the Olympics and everyone who’s here is gunning for a medal,” said Evans. “To even get here and be in the mix was an achievement in itself. “You can be the fastest man in the world but as soon as you land on that first turn, they guys who are behind can take advantage and cause chaos. Phillips found himself in a high calibre quarter-final, after finishing as the 10th fastest qualifier in the seeding run. He started in gate three of heat two; with second fastest qualifier David Graf in gate one and defending champion Maris Strombergs in next to him in gate two. Leading alongside Graf after the first bend, Phillips found himself barged off course and was sent crashing off his bike on the second straight. Unfortunately for Philips, he was unable to continue his Olympic journey and withdrew on medical grounds. Kyle Evans rode from gate six in heat four. His qualifying run ranked him in 21st place overall and he too faced a world class field. Evans put in a solid performance in his opening heat, finishing fifth, and keeping himself in contention. In the second heat Evans was right in the mix coming into the second berm but lost his position after sliding off the track and recovered well to finish in seventh place. Despite an excellent start, the rounds had taken their toll on the young rider from Wigan and Evans crossed the line in seventh place once again, meaning he would not progress to the semi-finals. Evans, 22, said his Olympic experience has been one he will treasure. “I’ve loved every minute of it. Before coming into this Olympics I went to London as a reserve and coming into this Olympics my main priority was to stay on my bike , enjoy myself and come away from the event actually smiling and looking back on it and having no regrets. Evans said he believed his team mate Phillips would be devastated to have gone out but that he would be back. “If I know Liam he’ll bounce back in no time, he’s an incredible athlete, he’s so determined to be the best in our sport and win as many bike races as possible, and that’s why it’s been so good for me to have him as my mentor and learn from him,” he said. In what turned out to be a crash-laden series of quarter-final heats, the world champion Joris Daudet crashed in his second ride and reigning Olympic champion Strombergs failed to qualify for the semi-finals.